Sea Turtle Camp is a family owned company, which means we’re funded only by our own achievements. The better we perform, the more we can fulfill our mission statement of inspiring youth to be proactive steward of the environment. We also know that when it comes down to it – no matter what kind of difference we want to make as a company, and no matter how much you share those values – if our camps are not both educational and exciting, we’re not living up to our fullest potential. 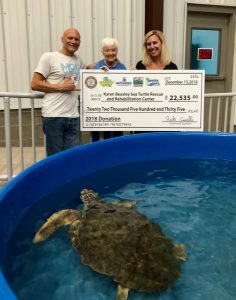 We contribute to the efforts of the Karen Beasley Sea Turtle Rescue and Rehabilitation Center by donating a portion of each camper’s tuition directly to the hospital. To date we have donated $149,815 in cash. Help us continue to support sea turtle conservation! Through education and public awareness we can ensure that future generations will be able to enjoy the natural wonder of these magnificent marine species. Please consider adopting a sea turtle or giving a donation to the Karen Beasley Sea Turtle Rescue and Rehabilitation Center.